Why Is My Sleep Disturbed? Sleep disruption comes in many forms. Sometimes you wake up at 4 a.m., feeling suddenly wide awake and can’t fall back asleep. Or perhaps your internal clock goes off to send you to the bathroom or stir you from a dream. Other times, you may not realize you’re waking in the night, but you feel far from refreshed in the morning. Our sleep patterns naturally drift from deep, slow wave to light awakening, but it can become problematic when you experience mental fatigue for three or more days per week. If this describes your situation, then it’s time to assess the various factors that may be contributing to your sleepless nights and change what you can to get the revitalizing sleep you need to function. Get Your FREE Sleep Analysis Test! The Cleveland Clinic states that “About half of all adults over the age of 65 have some sort of sleep disorder.” Although, “it is not clear if it is a normal part of aging or a result of medicines that older people commonly use.” Many older people wake to change positions or visit the bathroom (especially men with enlarged prostates), which is fine as long as you are able to doze off again right away. If you are up for more than 30 minutes a night for three or more nights a week, there may be a bigger problem like a sleep disorder or undiagnosed medical condition. About 40 million people in the U.S. suffer from sleep disorders. Sleep disorders may be traced back to hormonal issues, physical obstructions, or genetics. Any type of chronic pain, no matter how great or small, can disturb a person’s sleep. Everything from headaches and menstrual pain, to arthritis and fibromyalgia have been implicated as common causes of disturbed rest. Pain signals sent out by the body fragment sleep and reduce the time of the deepest, most restorative sleep cycles. Depression & Anxiety – 90% of sufferers experience trouble sleeping. Menopause – 61% of menopausal women have sleep problems due to diminished progesterone and changing estrogen levels. Diabetes – Blood sugar fluctuations, night sweats and frequent urination disturb diabetics in the night. Musculoskeletal disorders – Intense pain makes drifting off to sleep more difficult. Cardiovascular disease – Coronary artery disease triggers changes in circadian rhythm and causes chest pain, while congestive heart failure causes fluid accumulation around the lungs that wakes a person. Asthma: Airway constriction increases asthma attacks at night, with symptoms like coughing and wheezing. Heartburn or GERD – When lying flat, sometimes a person’s stomach juices flow back into the esophagus, causing burning and irritation, making sleep difficult. Eating disorders – Anorexics and bulimics suffer from malnutrition and hormonal changes that disturb rest. Kidney disease – Insomnia or restless leg syndrome often occurs when the kidneys cannot filter out waste. Thyroid disease – Overactive thyroids cause night sweats, while underactive thyroids bring on daytime excessive sleepiness — two issues that affect sleep quality. Additionally, botanical supplements like ginseng and guarana, as well as vitamins like B6 and B12 can wake people up when taken at night. Sometimes medical providers can adjust dosage, switch the type of medication you’re on, or prescribe a complementary sleep aid to help you rest easy. Light – Use heavy curtains and face alarm clocks away from you to prevent light from waking you up. Noise – White noise machines or fans can drown out the sound of traffic or tinnitus. Temperature – Use a fan, A/C unit or thermostat to keep the room close to the optimal 65-degree temperature. Exercise – Finish workouts at least two hours before bed to get body temperature and adrenaline levels down. Screen Time – Using computers, cell phones and TV sets at night suppresses natural melatonin production. 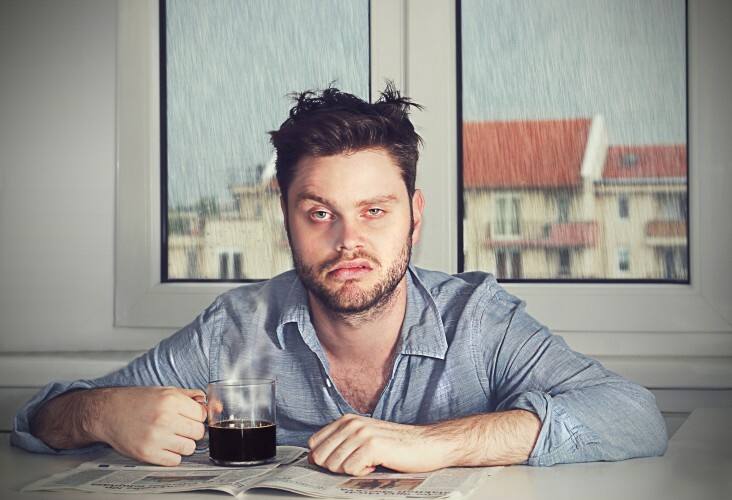 Caffeine – Experts recommend cutting off caffeine consumption no later than 4 p.m.
Alcohol – Finish drinking three hours before bed, stick to 1-2 drinks maximum, hydrate, and retire early. Pets In Bed – Set up a pet bed on the floor and remove jangling tags to get a better night’s rest. Partners In Bed – Shop for a specially designed “motion control” mattress to avoid up to 40-60 wakings a night. Mattress Support – Mattresses that are 10+ years old or poorly made can sag or lack support, causing back pain. The Sleep Specialists at Mattress World Northwest can’t help with all of your sleep woes, but they are specially trained to help you discover your personal sleep comfort profile and show you different brands and models that offer the perfect marriage of body-hugging plushness and well-manufactured support. Our 11 stores in the Portland, Oregon area – including Salem, Happy Valley, Clackamas, Wilsonville, Beaverton and more – offer the largest selection of high quality mattresses and adjustable foundation beds, so you’re guaranteed to find a sleeping surface that promotes a more restful, restorative sleep. We hope to see you soon!